The Great Irish Writers Room is a salute to the literary legacy of our nation’s greatest writers. They are forever immortalised in wax and ready to greet you at the entrance of the museum. There are many great Irish writers through the ages, but one of the greatest Irish literary legends celebrated here is James Joyce. Many tourist flock to Dublin on June 16th to celebrate Bloomsday. Bloomsday is a commemoration of the life and work of James Joyce. On and around this day, the events of his most famous work Ulysses are recreated throughout the city. Here at the National Wax Museum Plus, we bring the story of Ulysses to life through reading and re-enactments of this world renowned novel. Samuel Beckett, one of Ireland’s most loved writers, also stands proudly in place here in the Great Irish Writers Room. This is one of our favourite wax figures, the detail and likeness is second to none. 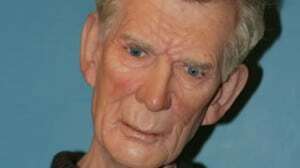 Beckett is regarded as one of the most influential writers of the 20th century and won a Noble Prize in literature in 1969. The beloved Oscar Wilde, a big favourite with our visitors is here to greet you when you enter the great Irish writers room. Don’t forget to pose for a pic!! And if you’re lucky and have our Wax Magic App Oscar might even come out to speak to you! Follow The National Wax Museum Plus’s board Irish Writers on Pinterest. Subscribe and be the first to hear of Wax Museum news, events and offers!